IJAPM welcomes author submission of papers concerning any branch of the Applied Physics and Mathematics and their applications in business, industry and other subjects. 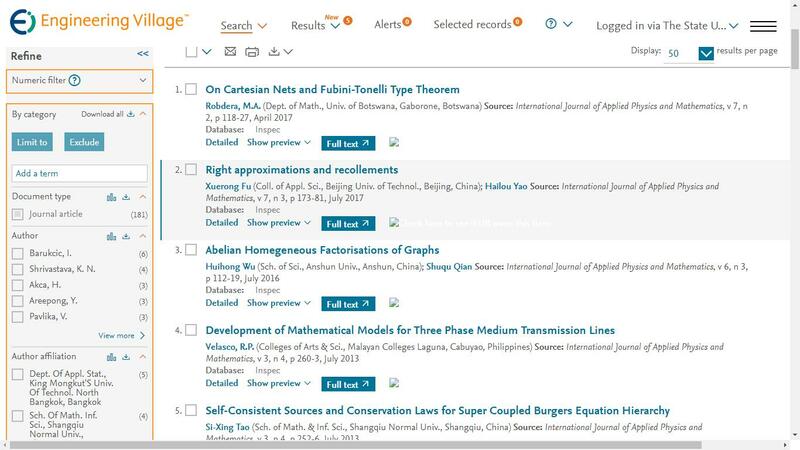 The subjects covered by the journal include advances in Instrumentation and techniques, applications of microscopy in the physical sciences, computational physics, non-linear physics, engineering and industrial physics, instrumentation, metrology and standards, and their applications. When submitting papers for potential publication in the IJAPM, please submit an original editable file in one of the (.doc, .pdf) style files. All figures, images, tables, etc., should be embedded into the original file. Detailed instructions on preparing papers for submission can be found in the Template Paper and Copyright Transfer Form. Further information on the scope of the IJAPM is also available upon enquiry of prospective authors. Authors accept the terms of Honor Code and Plagiarism Statement for Paper Submission, and that the paper is original research contribution with the references properly cited in the manuscript. Prospective authors are kindly invited to submit full text papers including results, tables, figures and references. Full text papers (.doc, .rft, .ps, .pdf) will be accepted only by e-mail: ijapm@iap.org. All submitted articles should report original, previously unpublished research results, experimental or theoretical. Articles submitted to the IJAPM should meet these criteria and must not be under consideration for publication elsewhere. Manuscripts should follow the style of the IJAPM and are subject to both review and editing. Each final full text paper (.doc, .pdf) along with the corresponding signed copyright transfer form should be submitted by E-mail: ijapm@iap.org. IJAPM publishes the authors' articles under a Creative Commons attribution-noncommerical license CC BY-NC-ND 4.0. Users of the author's published article are free to use, distribute, reproduce, and create adapted works using the published paper, but only where the use is for non-commercial purposes and IJAPM and the author are properly attributed. IJAPM are entitled to manage permissions for commercial use of the author's published paper. • Share their article for Personal Use, Internal Institutional Use and Scholarly Sharing purposes, under the condition that it contains the DOI link to the version of record on IJAPM, and all references to where this article has been published.